I have to confess to you. I was very, very nervous to make these arancini. 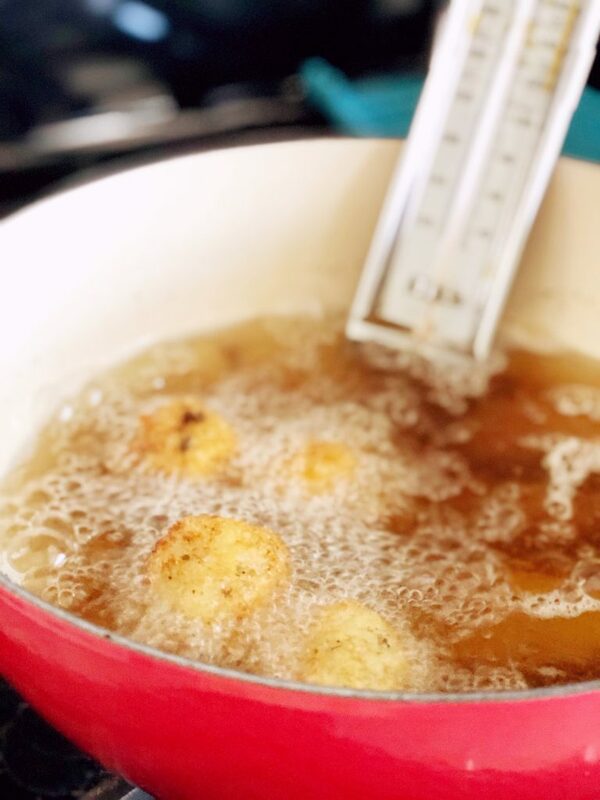 Basically, anytime a dish requires frying, I get a little nervous. It’s a method I’m not 100% comfortable with, and really, the internal guilt of eating something fried settles in when I am making it myself. BUT, these arancini were totally worth overcoming my fear for. This recipe calls for left over risotto! If you recall, last week I shared a recipe for my 25 minute mushroom risotto, which makes a great dish for arancini! 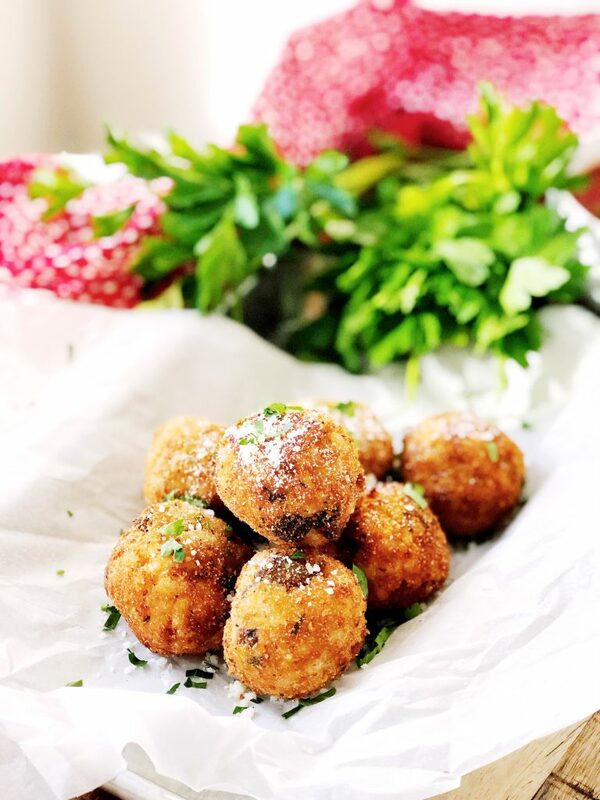 I took the leftovers from that risotto to make these little balls of utter perfection. You can make them ahead, too, and just reheat to serve! In my head, I really built up arancini to be an intimidating dish. But, when you’re learning something new in the kitchen, I think it’s important to just go for it! Face your fear, have a little courage, buck up, and try it. The worst thing that happens, it tastes terrible; second worst thing, it looks ugly. Regardless, if you pay attention, you’ll learn something new. 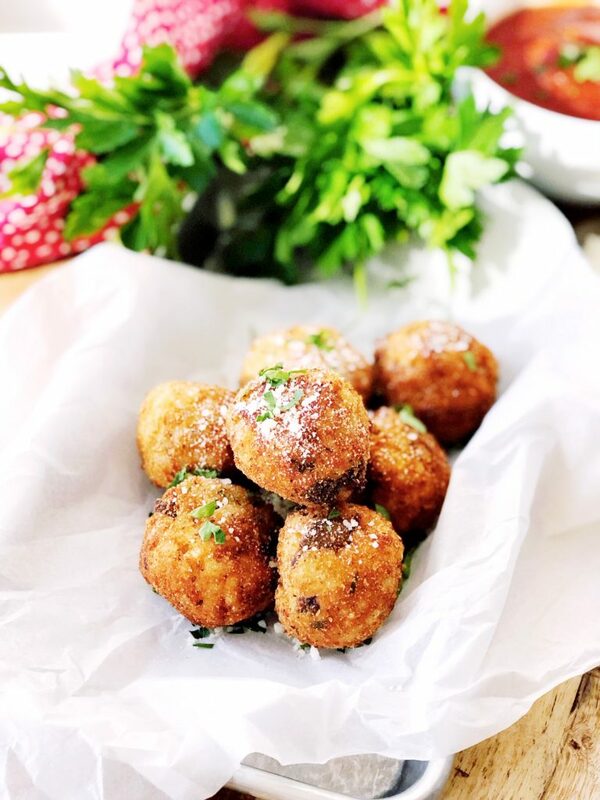 To make these, you’ll take some leftover risotto and form a ball that you place a pearl of mozzarella inside of. The great thing about using left over risotto for the arancini, is that you want your rice to be cold already! It helps the balls form. It is a little labor intensive, even with leftovers, but I swear, it’s totally worth it. 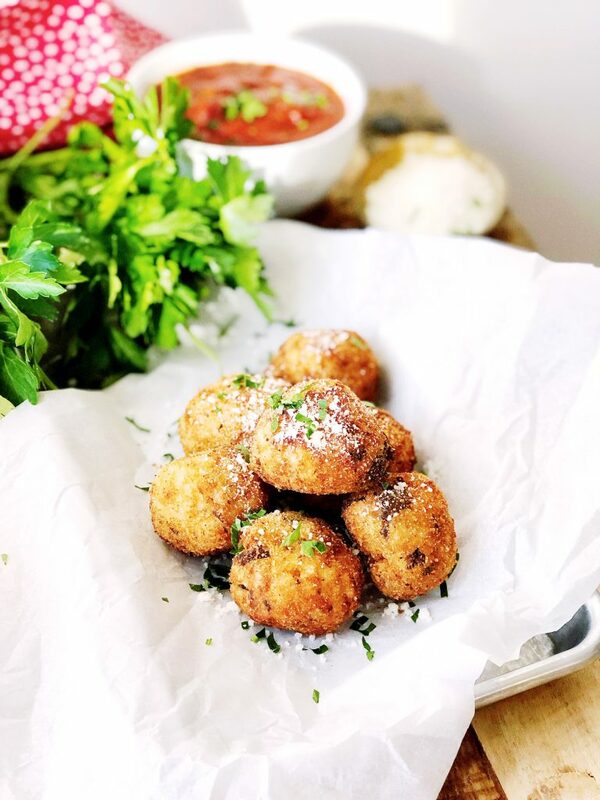 And once you make these arancini once, you’ll be ready to make them again and again. It’s so straightforward! You put eggs and breadcrumbs in with the rice, form the balls, stuff them with mozz, chill. Then, an hour later, roll them in bread crumbs and fry those babies up! 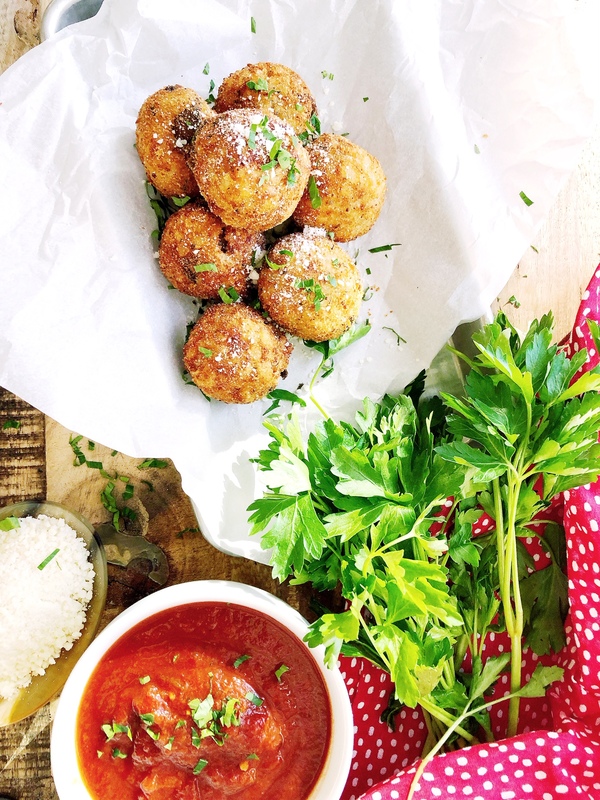 These arancini are much easier than you would think, I promise! They have an amazing crunch on the outside, and a cheesy, creamy inside. 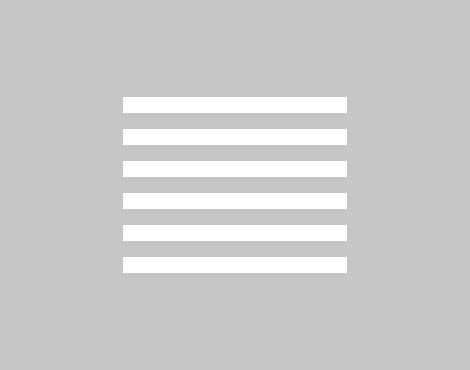 Line a baking sheet with parchment paper, set aside. Recommended to use a baking sheet with sides. In a mixing bowl, combine risotto, eggs and 1 cup of breadcrumbs. Mix until eggs are completely incorporated. Using a 2 tsp cookie scoop, form a ball of the rice mixture. Create a well and place one mozzarella pearl, forming the ball completely around the mozzarella, as you would a meatball. Continue with remaining rice and mozarella pearls, placing each on the parchment lined pan. After all of the balls have been formed, roll each one in the bread crumbs, coating them completely. Place the shaped balls on the sheet again and refrigerate at least one hour. Heat oil to 350 degrees, monitoring with your thermometer. Prepare another baking sheet or large cutting board with 4 layers of paper towel to catch oil from the fried arancini. Fry 3-5 at a time, do not crowd your oil, until they are golden brown. Remove from the oil and place on the papertowel. Repeat until all are fried. Garnish with parsley and parmesan cheese; serve hot or at room temperature with pizza or marinara sauce. These can be fried ahead of time and reheated in the oven at 350 for 10 minutes, or until the outside is hot.